Present an on-line (compact rather than hi resolution), searchable (ASCII character rather than image) version of the 393 page document "A Fourth Survey of Domestic Electronic Digital Computing Systems"
Pages 1 through 327 and 375 through 378 are included - I do not intend to do more. Some of the summary tables and the distribution list are not included in this conversion. The OCR and HTML process are not perfect, Errors must have been inserted. And there were some obvious character transpositions and other "warts" in the original text. The OCR process was erratic in horizontal position, currently some redundant user responses have not had the horizontal position problem manually corrected. Much of the document was in two columns, in font sizes that are difficult to read on commonly available display systems (CRTs etc.). This conversion separated the two adjacent columns and placed them into one vertically separated column. This results in a document much easier to read on the majority of electronic viewing devices. The greek delta (an isosolese triangle) is represented as a "[delta]"
Other Greek letters are approximated by italicized English substitutions. The plus over minus in represented as "+-"
The images were scanned at 300 pixels/inch (near the resolution of the printing process), reduced to about 800x600 pixel Super VGA size, and presented in medium resolution .jpg, yielding quite good approximations with file sizes of usually 50 to 100 kilo bytes. Some non-grey scale images are presented in .gif if they yielded smaller files. P.S. If you note problems or errors in this report, please e-mail me. - If there is an error in the conversion of the book to the .html, I will fix the html. - If there is an dispute of fact, I will note it on a dispute page. Qualified requestors may obtain copies of this report from DDC. as an official Department of the Army position. This report includes the results of a .fourth survey of the engineering and programming characteristics of one hundred twelve different electronic digital computing systems that have been developed since 1961. The report describes the application, numerical and arithmetic characteristics, input, output and storage systems, construction and checking features, power, space, weight, and site preparation and personnel requirements, production records, cost and rental rates, sale and lease policy, reliability, operating experience, and time availability, engineering modifications and improvements and other related topics concerning the computing systems. Fifteen comparative tables are included. This report supplements BRL Report No. 1115 (Public Bulletin 171265, OTS, U. S. Department of Commerce). On behalf of the Computing Laboratory of the Ballistic Research Laboratories, the author wishes to extend his appreciation for the excellent spirit of cooperation displayed by the various representatives of the computer industry who have devoted their time and effort in responding to the survey inquiries. The greatest individual assistance, approaching that of a co-author, was rendered by WAC Master Sergeant Joy G.J. DeMasse. An undertaking as comprehensive as this computer survey, requires that a large quantity of data has to be acquired, correlated, transcribed and checked. Particular attention must be paid to accuracy and detail. We are heavily indebted to Master Sergeant DeMasse for the major role she has performed in all phases of preparation of this report. She has been responsible for the general conduct of the survey, the control of communications with respondents, the preparation of correspondence, screening returns, sorting returns, preparing the layout of all the pages, typing, titling, and making all the photo arrangements. 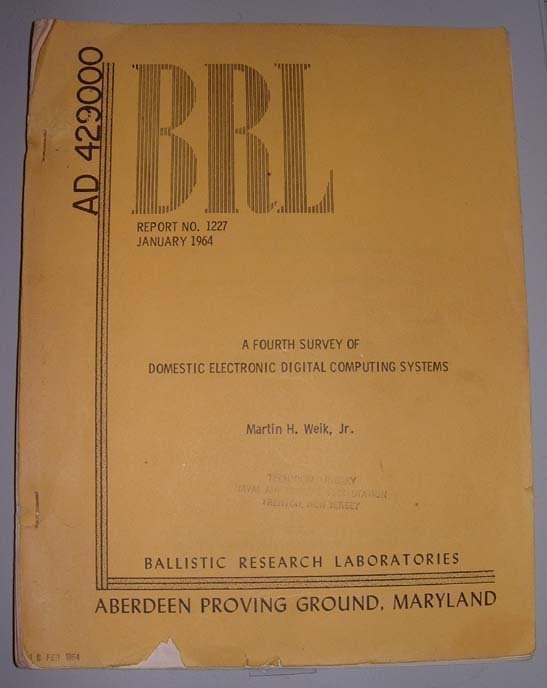 A survey of electronic digital computing systems was conducted in 1955 by the Ballistic Research Laboratories in order to provide technical data for the evaluation of the then existing computing machine complement of the Laboratories. The results of that survey were made available in BRL Report Number 971, M. Weik "A Survey of Domestic Electronic Digital Computing Systems". The report was well received by persons in government and industry. The U.S. Department of Commerce undertook further printing and distribution of the report under cover of Public Bulletin 111996, Office of Technical Services. A second survey of electronic digital computing systems was conducted during October, November and December 1956 and January 1957 by the Computing Laboratory of the Ballistic Research Laboratories. The second survey was conducted as part of the continuous surveillance and evaluation program of the Laboratory. The results were published as BRL Report Number 1010, June 1957. This report covered the results of the new survey and superseded BRL Report 971. The U.S. Department of Commerce undertook further printing and distribution of this report also, under cover of Public Bulletin 1119968, Office of Technical Services. A third survey of domestic electronic digital computing systems was conducted in 1960. Due to the great interest which had developed in these survey reports, the Department of Defense decided to co-ordinate this activity among the Armed Services. The results of the third survey were published as BRL Report Number 1115, "A Third Survey of Domestic Electronic Digital Computing Systems" March 1961 and as Public Bulletin 171265, Office of Technical Services, U.S. Department of Commerce. The Third Survey report was comprehensive, and superseded all previous survey reports. This Fourth Survey Report only supplements the Third Survey Report, and includes only those domestic electronic digital computing systems that have evolved since the third survey in 1960, except for the 15 comparative tables in Chapter III. The tables include all the systems that have been developed since the ENIAC, some 20 years ago. Some 330 computers are entered in the comparative tables. Before any major decision can be made regarding the acquisition, installation, operation, improve- ment or retirement of computing equipment, first hand technical information must be obtained concerning the characteristics, availability, cost, operational problems, capability and useful life of available systems. Efficient management requires that the experience of others be exploited wherever such exploitation is beneficial. The present trend in the rapidly changing computing and data processing hardware field is toward higher operational speeds, increased memory capacity and reliability, and solid state electrical components, including a widespread use of semi-conductors and the advent of the use of thin magnetic films in standard commercial systems. However, only existing or readily available equipment may be utilized for the immediate solution of scientific and commercial data processing problems. Many persons in the computing and data processing field continually seek answers to many different questions simultaneously. Some of these questions are: Can present methods, practices and procedures used in a given organization be accomplished by automatic computing and data processing equipment? Will investment in such equipment reduce costs, provide improved service, conserve manpower or save time? When shall existing computing equipment be modified, supplemented or replaced? Of all available equipment, what type of system is best suited for the solution of a given problem or a given group of problems? Is the maximum possible return being obtained from a given investment in computing equipment? Does a given problem require specially built equipment or is a solution to be found with commercially available standard equipment? Should computing equipment be rented or purchased? Should a system be installed "on the premises" or should computer time be purchased elsewhere? The purpose of a computer surveillance and evaluation program is to provide answers to these and similar questions. Government agencies, particularly Department of Defense agencies, and their contractors, require the latest technical information concerning computing and data processing equipment in order to properly establish their policy regarding acquisition, installation, operation, improvement and retire- ment of equipment. The purpose, therefore, of this survey report is to allow government agencies and their contractors to benefit from the results of the computing system surveillance and evaluation program conducted by the Ballistic Research Laboratories. This report is limited to commercially available or existing operational electronic digital computing and data processing systems manufactured or operated within the United States that have evolved since 1960. Large, intermediate and small scale systems are included, regardless of whether the determination of "scale" is based on size, weight, cost, storage capacity or any other reasonable criterion. An attempt has been made to include general purpose, special purpose, on-line, real-time, and control equipment. It must be borne in mind that there is no clear-cut line of demarcation between systems designated as special purpose computing machines and certain "on-line" control systems, in which a computer is used to determine operational control-commands, based upon data received by the system from instruments measuring the results of the commands. Many of these systems usually have analog input and output with internal digital computation and thus require transformation of data to and from digital form. Among the items not covered by this report are analog computing systems, foreign systems or separate computing components, such as analog-digital converters, separate storage units, arithmetic units, input-output units, and data recording units, except when these are associated with specific complete systems. Many recording media converters, such as magnetic tape-to-card converters, card- to-paper tape converters, etc., are not specifically covered, except again as they are used with specific complete systems. By a "complete system" is meant an electronic digital computing system with input, output, control, arithmetic and/or logical, and storage units. The large volume of technical data processed for this report will make errors unavoidable, particularly in correlating and transcribing information. It will be appreciated if errors are brought to the attention of the Ballistic Research Laboratories. Subjective statements, claims and criticisms were screened as much as possible. Every endeavor was made to insure that the information included in this report is factual. To a large extent, certain superlative adjectives used in describing equipment, were deliberately eliminated as a matter of fairness and in order to avoid implication in sales activities. The interpretation of the data included in this report is perhaps the most difficult aspect of all, therefore much of this activity is left to the reader. In Chapter II, the data are grouped under alphabetically sequenced computing systems names. The charts and tables in Chapter III have been prepared in order to show various relative characteristics, features and trends. A brief analysis and interpretation of the data accompanies these tables. It must be emphasized again that data concerning computing systems taken out of context or disassociated from other related data, can be misleading. Because of this, the information contained in this report, particularly the tablular data of Chapter III, must be used with appropriate caution. It is recommended that the prepared tables in Chapter III be used only as generalizations to show trends. Data on specific systems should be taken from the systems descriptions rather than from the prepared tables. Further details must be obtained from manufacturers or users directly. This report does not constitute an indorsement of any of the products described within it. As has been previously stated, the computing field is a dynamic and rapidly changing one. From a technological point of view, some of the information contained in this report is obsolete as it is being printed. Certain computing systems may be considered obsolete when they are installed. However, in most cases, manufacturers are accepting orders and will continue to produce, the systems described in this report for quite a number of years. Chapter II contains engineering and programming descriptions of 112 different types of computing systems. Persons who are interested in the acquisition of systems will find useful information on applications, cost, personnel requirements, and power and space requirements for specific systems. Operators may find useful suggestions on modifications and improvements. The question of reliability, a particularly difficult one to resolve, has been answered to some extent under the sub- heading: Reliability, Operating Experience. It is hoped that enough general and specific technical data have been compiled in the following three chapters to permit anyone involved in the computing and data processing field to draw at least some general conclusions and find answers to some of the questions which he may have.